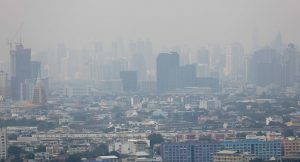 As Bangkok continues to sit under the most awful smog the Thai authorities came up with yet another questionable way of handling the problem. The Tiger reported today that Bangkok is preparing to launch 50 drones to spray water in the skies over the capital. The water will contain molasses to aid in the attachment to smog particles. It looks like a sticky situation. A drone that can carry 10 litres of water – really? That is a lot of weight. The water will contain molasses which and is predicted to help relieve the smog problem. Scientists say that the molasses will assist in the trapping of smog and cause it to fall onto the ground as black drops (not so if you happen to be walking or driving underneath at the time). Water trucks are being prepared to clean roads and vehicles which might be affected tomorrow. That’s good – the water trucks no doubt have old diesel engines that can belch out black smoke into the city’s air. Meantime across Bangkok public and private schools have been closed for two days. I have no idea how that helps. Keep the kids indoors in classrooms and play areas would help. But sending them home so that parents need time off to care for them or to take them to work does not seem a solution. And when they get home there is no air purifier as Bangkok has sold out with one month at Powerbuy until they next have stock.